Yesterday I announced a new Tuesday Quick Tips series for the blog. Today marks the start of another series -- Wednesday Resources. Every Wednesday (at least through the test period in June), I'll either release a new resource for All Freelance Writing readers or I'll promote a resource I highly recommend. Through June I already have new resources lined up every week though. .
That brings us to today's resource, the next in my series of Scrivener project templates. Like the last one -- a white paper template -- this one was designed for freelance writers. This week's Scrivener template is a case study template that you can use for client projects or to write case studies to promote your own writing business. In the research folder you'll find documents where you can include statistics you might want to use (such as a client's conversion stats before and after you tweaked their marketing copy). 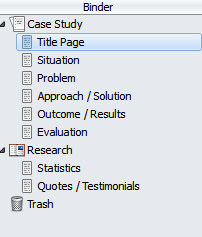 There is also a document to store quotes from your client so you can pick and choose from them later, highlighting ones that best support your case study's story. Don't miss the rest of my free Scrivener templates including the white paper template, single blog template, and multi-blog template. If you'd like to suggest a Scrivener template idea, feel free to contact me. Thanks for the free template! Will be trying it out soon 🙂 looks cool. Thank you! I’ve been scouring the web looking for business templates for freelancers to use with Scrivener. I was just searching for instructions on how to create my own when I found your Case Study (white paper, blog, multi-blog *swoon*) template. This is a very appreciative girl over here, thanks again! The file is an EXE file and will not be unzipped by Mac. There is no EXE file. It’s a .zip (compressed folder). After downloading, you have to decompress / extract it before you can use the file inside. When you do try to use that file, you can’t simply open it like a Scrivener project file. Make sure you use Scrivener’s template import function instead. That’s what adds it to your template collection to be re-used for multiple projects.